We now have a complete listing for all our events planned for 2019. For the T Party this year we have decided to go back to the Shuttleworth Collection at Old Warden which we last visited in 2015. You can see the listing and ticketing instructions for them all on our 2019 Events page. There will also be display posters and flyers at the T Register stand at the MG and Triumph Spares Day at Stoneleigh on 10 February. So here’s hoping the weather is going to be as good as it was last year! 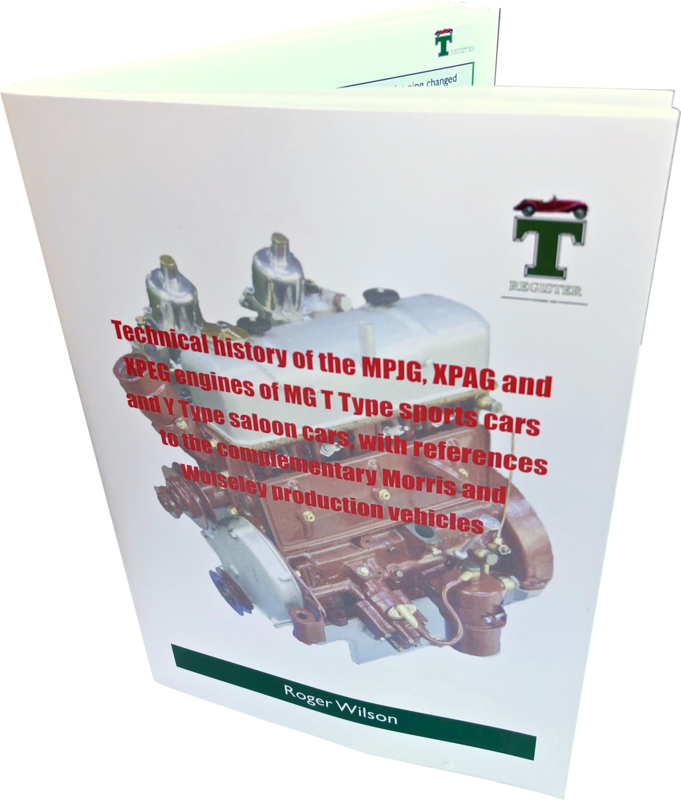 We have now published a fully revised edition of Roger Wilson’s T Type Engines booklet first published by the MG Car Club T Register in 2012. The new edition contains all that is currently known about changes during engine production and at what engine number and date of introduction, as well as technical information on the original camshafts and distributors. It also contains new information on the casting marks found on MG engine blocks, and the detailed information in the text has been thoroughly revised using painstaking research into contemporary documentation and other resources. You can order the book from the T Register’s online shop and it’s priced at £6.00. so if you want to go, get your email in to Sally Silcock asap. The hotel in Normandy needs confirmations and deposits by 1 November to hold the prices that have been negotiated. The hotel is the Ferme de la Rançonnière, Crépon which we have used before. The October MGCC Council meeting and AGM will be held at the Conference Centre, MG Motor UK, Main Gate, Lowhill Lane, Longbridge, Birmingham, B31 2BQ on 20 October. The club’s articles require motions for debate to be submitted by 7 September so if you do want anything discussed get in touch quickly with the T Register Secretary. Kimber House have also started sending out an email newsletter to members on a regular basis to complement Safety Fast! magazine. We think it is being sent to all members for whom Kimber House have an up-to-date email address logged against their membership details. Unfortunately not all members have given their email address when subscribing – especially those who have been members for a long time! 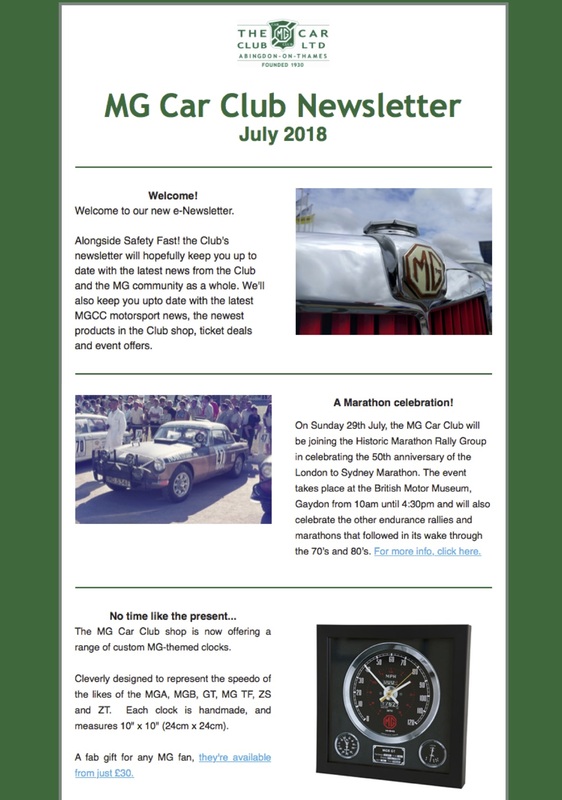 It would be a mammoth task for Kimber House staff to pro-actively collect members’ email addresses, so if you do want to receive the Kimber House newsletter, the best advice is to contact Liz Allsworth, the Membership Secretary, email lizallsworth@mgcc.co.uk or telephone her on 01235 849734 and let her know your email address. The September T Register email Newsletter has now been sent out and the latest edition of Captain Castor has been published. If you are a subscriber and haven’t yet got the Newsletter, let us know by contacting David Wardell. There are reports in this month’s issue of the European Event of the Year held by MGCC Schweiz in Films in eastern Switzerland together with lots of photos courtesy of Stefanie Broch, Tina Kraft, John Morgan and Sally Silcock. Many thanks to them all. and fill the form in at the bottom of the page. You can see the latest issue of Captain Castor at http://www.mgcc.co.uk/tregister/captain-castor-issue-no29/. Captain Castor was one of the lucky few who went to the European Event Event of the Year in Flims but he had trouble with the place name with his spell checker – yes, he does use one! – and got confused about what was going on at the event. The August T Register email Newsletter has now been sent out and the latest edition of Captain Castor has been published. This month it looks like GDPR is taking a grip – we’re getting warnings that some email servers have instituted a system called DMARC which blocks email marketing stuff which of course they think our Newsletter is. The effect could be that the T Register Newsletter ends up in your email junk/spam folder. If you want to continue receiving the newsletter, please mark it as ‘not junk/spam’. If you don’t, we will get a return saying you have marked the Newsletter as spam and we will then NOT be able to send you anymore Newsletters. Captain Castor tells all by clicking the link. We have added an article received from Hideo Okane, Kenji Matsuoka (Kobe MG Car Club) and Peter Cook (MGCC Overseas Director) about the famous Japanese actor Toshiro Mifune and his love of his TD. Mifune was the actor who played a ronin (a wandering Samurai with no master); a man with no name who appears out of the blue in trouble spots, and by using his sword disposes of villains, and disappears as mysteriously as when he arrived, which many believe was the model for the Clint Eastwood Western films. He also starred in many western films such as Hell in the Pacific, Midway and Grand Prix. The May T Register email Newsletter has now been sent out and the latest edition of Captain Castor has been published. You can see the latest issue of Captain Castor at http://www.mgcc.co.uk/tregister/captain-castor-issue-no25/. Captain Castor was of course at Rebuild and he got very interested in the cyclic variation in the low temperature variability of stoichiometric mixtures. You can see his plain english explanation by clicking the link.